Don’t purchase individual stocks, diversify massively! Almost everyone agrees that paying an advisor 1%+ to manage your money and “pick” funds will yield LESS returns than if you just BE THE MARKET. Robo-Advisors is an online wealth management service that provides automated, algorithm-based portfolio management advice without the use of human financial planners. A central focal point of the podcast is finding technology to find higher yields and enable us to invest smarter, and more efficiently. 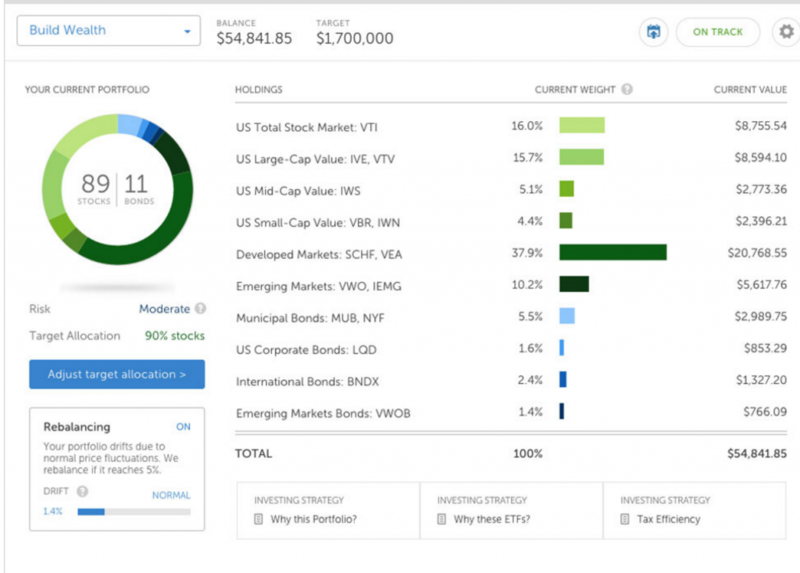 When it comes to investing in stocks, bonds, and equities, we are huge proponents of using Robo-Advisors like Wealthfront and Betterment. The beauty of these is that they are 100% fully automated investing. The goal is not to beat the market, but to BE THE MARKET by tracking low-cost index funds that give you broad market diversity. The funds are automatically rebalanced, and tax loss harvested in a way that a human could never do. Anyone who is investing in the market should consider having a robo-advisor account do the work for them. If you want to see our opinion on how Wealthfront and Betterment stack up, you can read the full article here. We recommend visiting their sites, and taking the quick 6 question new account survey to get a feel for their service and how they analysis your personal risk tolerance and investing goals. An alternative to using a Robo-Advisor is to implement a strategy and asset allocation model yourself. For those in the crowd that are “do it yourself ‘ers”, we suggest implementing your own strategy through a low cost, low free index fund, with added emphasis on low cost, low fee. The standard in the investing world for this is Vanguard, where you can buy market indexes/ETFs that track the S&P 500 (VOO) for just 0.05% expense ratio. That’s practically free! For anyone who does not have access to Vanguard, there are countless other platforms to purchase low-cost funds. Just google “Low-Cost Index Funds” and you’ll be served a plethora of options that any investor anywhere in the world can put into play. A few top providers include Schwab, Fidelity, and iShares (BlackRock).